Equipment Used: Olympus PAS 35mm camera, IP camera VT1000 surveillance camera, Dell c600 laptop, Kodak easy share DX4530 5.0 mega pixel digital camera, Fuji finepix S7000 digital camera, Radio Shack DR-85 digital recorder, Radio Shack CTR-122 cassette recorder, Sony digital 8 steady shot DC R TRV330, Radio Shack electric condenser microphones (omni directional) 33-3014, Radio Shack boundary condenser microphone (omni directional) 33-3022, Non-contact IR thermal probe scanner, Tri-field natural EMF meter (x3), Tri-field meter (x3), Temperature gauge (x4), EMF gauss meter (x2), 3 camera video recording surveillance equipment with quad processor and VCR, 4 camera video surveillance system with infrared with quad processor and DVD recorder, Apple G4 laptop, Radio frequency counter, Hall Effect Gauss meter from Integrity Design and Research Corporation. A bare probe was used with the gauss meter. The bandwidth of the bare probe is 68Hz at 3dB., Sper Scientific Electromagnetic Field Test 840025 EMF meter. Bandwidth is 30 to 400Hz with 4% accuracy at 50Hz/60Hz. Data is displayed as mG., Air ion Counter. Positive and negative ion counts are displayed as ions/cm3., Sony Digital Handycam DCR-TRV19 NTSC with night shot., Olympus Camedia Digital Camera C-4000 zoom. 4.0 mega pixel., GE Personal Portable Recorder and Cassette Player 3-5027., All sound data was digitized and processed using Acid Music 4.0 and Audio Cleaning Lab 3.0., Automated Data Collection System (ADaCS), Triaxial ELF magnetic field meter with pc interface. The meter has a bandwidth of 30Hz to 2000Hz and an accuracy of +/- 3% at 50Hz/60Hz and +/-5% at 40 to 200Hz. Data was logged using the supplied software., HOBO Temperature data logger from Onset Computer Corporation with data logging and archiving ability. Software provided by Onset Computer Corporation was used for data logging and archiving., GM-10 radiation detector from Black Cat Systems with pc interface. The Radiation Acquisition and Display (RAD) Software was used to log and archive the data. Radiation detected includes alpha, beta, and gamma/x-ray. Data is displayed as counts per minute (cpm)., Panasonic Toughbook CF-45 laptop computer. A family member contacted our member, Troy Hartman, to discuss their house being haunted. Strange occurrences such as: pressure on the backside in the basement, hearing voices, hearing footsteps, hearing doors slam, seeing an apparition of a man, feeling bed covers being pulled down, seeing a light dim, and seeing the lights dim during a oiuja board session. The family has a lot of unanswered questions and is seeking information. There have been numerous owners throughout the years (a list of owners is on file with the S.W.P.R.G.). The current owners bought the house in September 1960 and restored it to a single-family home. The current owners have lived at the location for approximately 15 years. There is construction currently being done in the home. The current owners report that the disturbances began within months of the family moving in and occurred with a frequency of every 1 to 3 months. Disturbances experienced include: pressure on the backside in the basement, hearing voices, hearing footsteps, hearing doors slam, seeing an apparition of a man, feeling bed covers being pulled down, seeing a light dim, and seeing the lights dim during an ouija board session. There have no disturbances experienced for the past ten years. Finally, there are unconfirmed reports of two deaths in the house one man and one woman. Upon arriving at the location, there was a brief tour of the location for those who did not attend the pre-investigation. The equipment was set up and the investigation group split up into three teams: the outdoor team, the basement/1st floor team, and the 2nd floor/attic team. 1. Surveillance cameras were placed in the basement, first floor blue room, stairway from the blue room to the 2nd floor, second floor hallway, second floor bedroom at the top of the stairs, and in the attic. All video was captured on a VCR, computer, or DVD recorder. A Sony handycam was placed in the living/family room next to the dining room. 2. 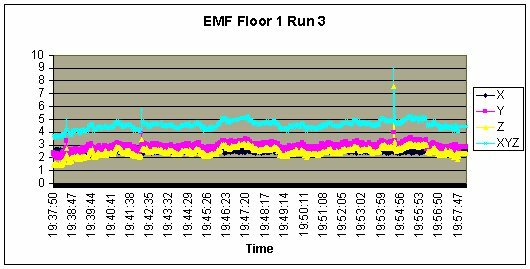 The automated data collection system (ADaCS) for EMF, temperature, and radiation was set up and run in the basement, the first floor blue room, and the 2nd floor hallway. A Trifield meter and Natural EMF meter were placed along with ADaCS. 3. Ion counts, gauss meter readings, and radio frequency analysis was done on all floors and outside of the house. 4. The three teams did various data sweeps of their assigned areas. They recorded video, took pictures, measured temperature, EMFs, natural EMFs, and logged all data and personal observations. 5. Cindy and Derek did EVP sessions in the basement, 1st floor dining room, and 2nd floor hallway. The sessions occurred between approximately 8:00pm and 8:45pm. 6. Quiet observation in the dark was done from 9:15pm to 9:40pm. A large area of deterioration and some open space was observed on the southeast overhang by the roof. This could let in various animals, as evidenced by the mouse and bat droppings found in the attic. Also, wind currents could get in and cause pressure changes that would lead to doors opening and closing. In addition, the wind currents could theoretically cause infrasounds, which have been shown to be the cause of some reported hauntings. A bat was seen and recorded on video in the basement. 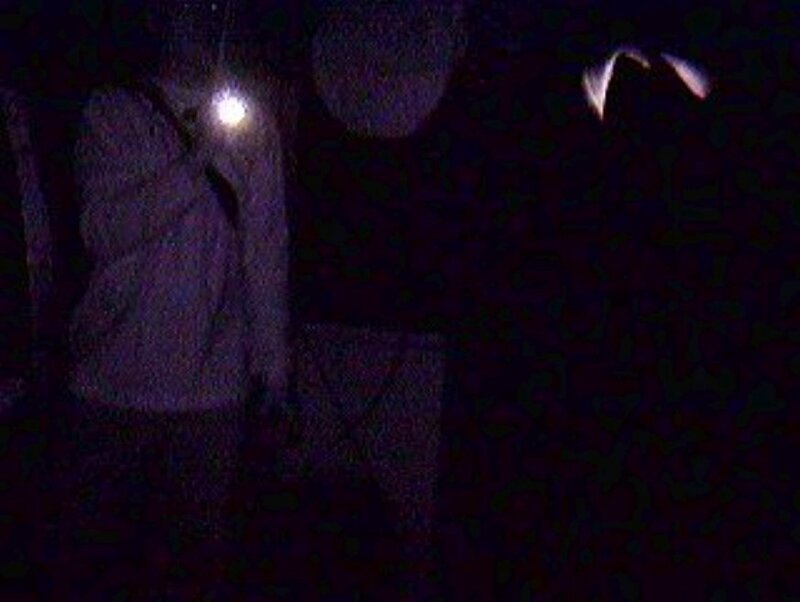 The still image below shows the bat and an investigator with flashlight. Numerous investigators heard what sounded like footsteps outside on the southeast end of the property by the trees by the street. 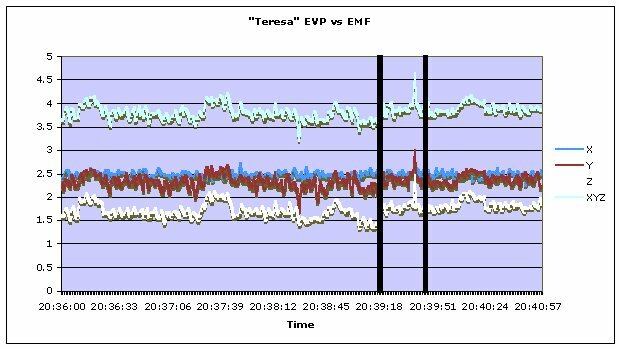 Natural EMF readings of 2-5 microteslas preceded the sounds on a few occasions. Nothing of note was seen on any of the video recorded. A picture with smoke/mist/fog was taken outside. 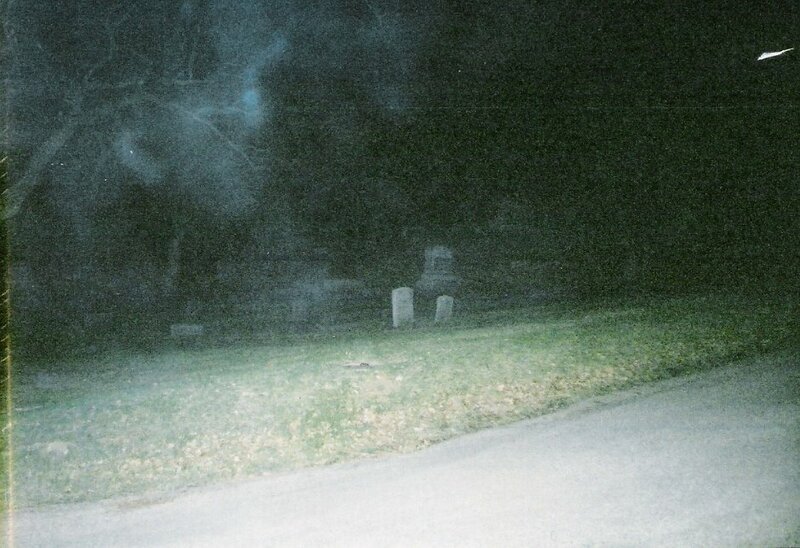 While this could be paranormal in nature, it could be smoke, someone's breath, or an area of high humidity. Ion counts in the blue room, upstairs hallway and bedrooms were 1000 positive ions/cm3 and 300 negative ions/cm3. Ion counts in other locations and areas where there are no reports of paranormal experiences range between 400 to 500 ions/cm3. High concentrations of positive ions have been associated with irritability and negative moods while negative ions have the opposite effect (Charry and Hawkinshire, 1981). Gauss meter readings of 800 to 1000mG were recorded in the blue room, 2nd floor hallway, and the 2nd floor bedroom. The rest of the home had readings in the 350 to 500mG range and are similar to those locations where no paranormal experiences have been reported. Trifield Natural EMF meter readings stayed at 2uT with 'spikes' to 5uT in the higher points of the cemetery, the blue room, 2nd floor hallway, and 2nd floor bedrooms. These readings were similar to those obtained during the pre-investigation on March 13th, 2005. All other areas had readings between 0 to 1uT. Readings in the 0 to 1uT range are normal in most situations. These consistent readings and 'spikes' could be indicative of paranormal energy or it could be an area of relatively high natural energy. There was a 5mG Trifield EMF 'spike' for about 40 seconds in the bedroom storage area. No source for the 'spike' in EMF could be located. There was a 5mG 'spike' for about 60 seconds by the second floor bedroom door. No source for the 'spike' in EMF could be located. Most other areas measured during the sweeps had readings of 1 to 2mG. All other 'spikes' in EMF could be attributed to electrical sources or plumbing. There was a 5mG 'line' in the basement that followed wiring in the ceiling. The six graphs below show the data collected for the blue room, basement, and second floor hallway. The background EMF on the first floor ranged between 3 and 5.5mG with 'spikes' of 13mG, 6mG, 9mG, 17mG, and 20mG. Normal background levels usually range between 1 to 2mG. 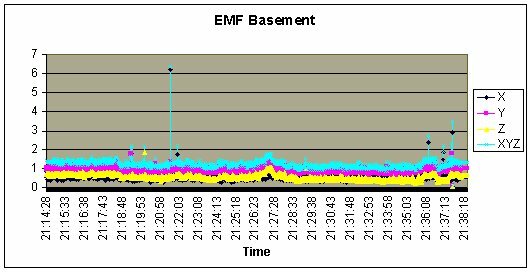 The background EMF in the basement was approximately 1.5mG. There were 'spikes' of 2mG, 2.8mG, 3.5mG, 2.3mG, and 6.5mG. 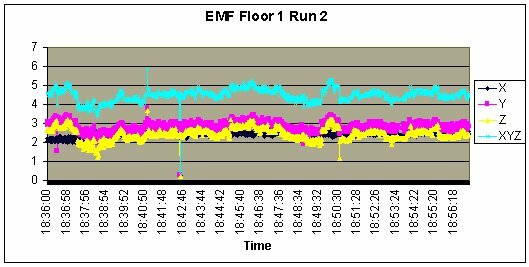 The background EMF in the second floor hallway ranged between 0.9mG and 1.4mG with one 'spike' to 1.7mG. Unexplained 'spikes' in EMF have been reported in other locations where there are reports of paranormal experiences. There was nothing of note for the ambient temperature readings taken at any of the three locations. The three graphs below show the data collected for the blue room, basement, and the 2nd floor hallway. A relatively large drop in cpm at 7:28pm in the blue room. This was followed by an EMF 'spike' of 12mG (see previous EMF graphs). A period of low cpm in the basement from 9:28pm to 9:32pm. This was followed a few minutes later by an EMF 'spike' of 2.7mG (see previous graphs). The low amount of variance in the cpm in the second floor hallway. Other researchers have noted drops in radiation and 'spikes' in EMF in areas with reported paranormal activity. A frequency of approximately 154MHz was recorded frequently. Approximately 60 segments were recorded during the EVP sessions. Sixteen of those were suitable for further evaluation. The majority of the EVPs were class B and class C.
There were technical difficulties with the microphones during the session. In addition, a fresh video camera battery was completely drained within 4 minutes of starting the EVP session. These phenomena of sudden draining of batteries and other technical difficulties have been noted in other investigations of locations with reported paranormal experiences. The majority of the sounds/voices recorded were random phrases, words, and singing. There is the possibility that the sounds/voices recorded could be due to cell phone/radio interference and not paranormal in nature, especially with the strong 154MHz frequency noted above. However, some of the voices recorded seemed to be referring to the questions asked or the topic of conversation. The other EVP was heard after Derek says, "dripping water." The phrase "There's nothing to drip" was recorded on the cassette recorder. There was a statistically significant increase in the EMF level during the time period that this EVP was recorded. The graph and statistical analysis are shown below. 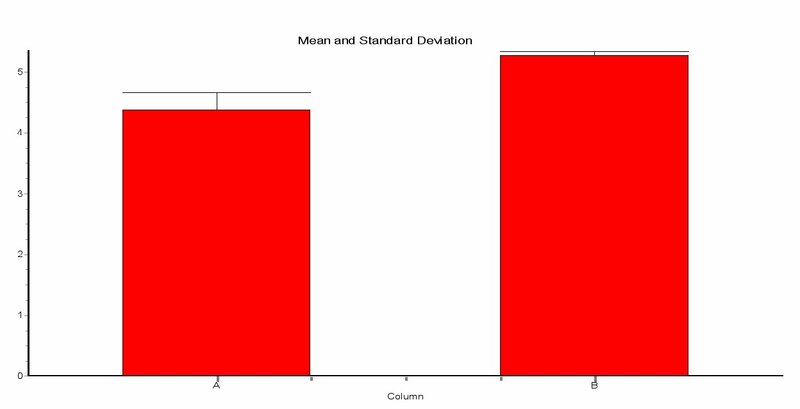 Do the medians of XYZ and Column B differ significantly? The two-tailed P value is < 0.0001, considered extremely significant. The P value is an estimate based on a normal approximation. Sum of ranks in XYZ = 500528. Sum of ranks in Column B = 15092.